NASA's Kepler spacecraft has spotted 503 new potential alien worlds, some of which may be capable of supporting life as we know it. "Some of these new planet candidates are small and some reside in the habitable zone of their stars, but much work remains to be done to verify these results," Kepler mission manager Roger Hunter, of NASA's Ames Research Center in Moffett Field, Calif., wrote in an update last Friday (June 7). The new finds were pulled from observations Kepler made during its first three years of operation, from May 2009 to March 2012, researchers said. The telescope hasn't done any planet hunting since being hobbled by a failure in its orientation-maintaining system last month. The $600 million Kepler spacecraft launched in March 2009, kicking off a 3.5-year mission to determine how common Earth-like planets are throughout the Milky Way galaxy. Kepler spots exoplanets by detecting the tiny brightness dips caused when they pass in front of their stars' faces from the instrument's perspective. The observatory does this precision work by staying locked onto 150,000-plus target stars using three gyroscope-like devices called reaction wheels. Kepler launched with four functioning reaction wheels — three for immediate use and one spare. But one wheel, known as number two, failed in July 2012. And a second (number four) gave up the ghost last month, robbing the spacecraft of its precision pointing ability. If at least one of the failed wheels cannot be recovered, Kepler's planet-hunting days are almost certainly over and a new mission will have to be drawn up for the spacecraft. Engineers have identified a number of tests that could help gauge the likelihood of bringing back the balky wheels, Hunter said. They're currently developing these commands on the Kepler testbed at Ball Aerospace in Boulder, Colo., where the spacecraft was built. "It will likely be several weeks before they are ready to implement the commands on the reaction wheels aboard the spacecraft," Hunter wrote in the June 7 update. "We will continue to provide updates on significant changes as these plans develop and mature." Whether or not Kepler can get healthy again, the mission's exoplanet finds will keep rolling in for years to come, researchers say. Kepler has collected huge amounts of data, and team members have had time to go through just about half of it so far. 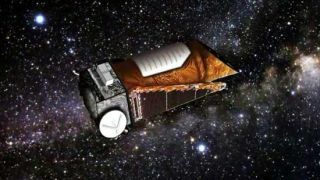 "We have excellent data for an additional two years," Kepler principal investigator Bill Borucki, also of NASA Ames, told reporters last month. "So I think the most interesting, exciting discoveries are coming in the next two years."